The men’s college basketball season ends tonight. The two-year experiment of playing college basketball on warships may have ended over the weekend. A report published Saturday by The Florida Times-Union outlines how a mixture of unexpected insurance costs, the downsizing of the proposed host ship from a carrier to an amphib and the on-court condensation that canceled the game at halftime contributed to a $736,000 loss for the city of Jacksonville in staging the Navy/Marine Corps Classic at Naval Station Mayport, an game that was supposed to benefit military charities. A quick recap: Of the three men’s games played on flattops last season, only one went the full 40 minutes — and that one was delayed two days by weather, saw every surrounding event attached to it collapse, and had enough in-game problems to make a return engagement unlikely. 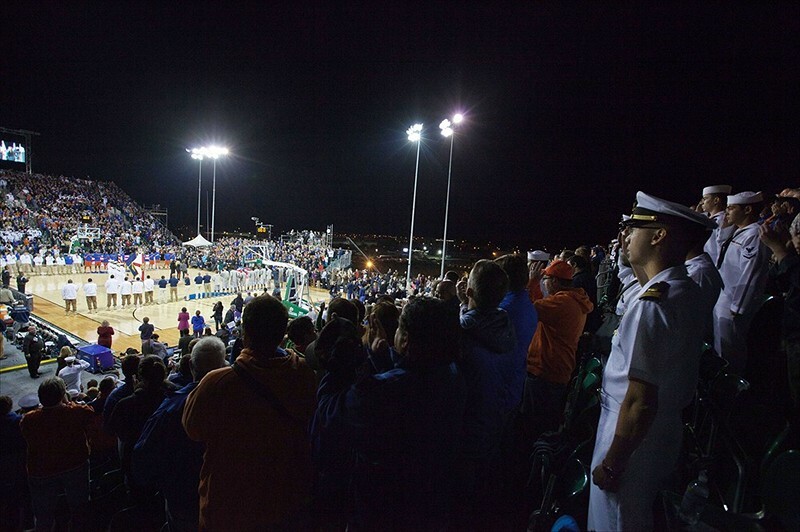 The game set for the decommissioned aircraft carrier Yorktown in South Carolina never got started because of moisture on the court; organizers recently announced they have no plan to host a game in 2013. No other groups or carriers have announced plans for a ’13 game. Well, there’s always hockey.